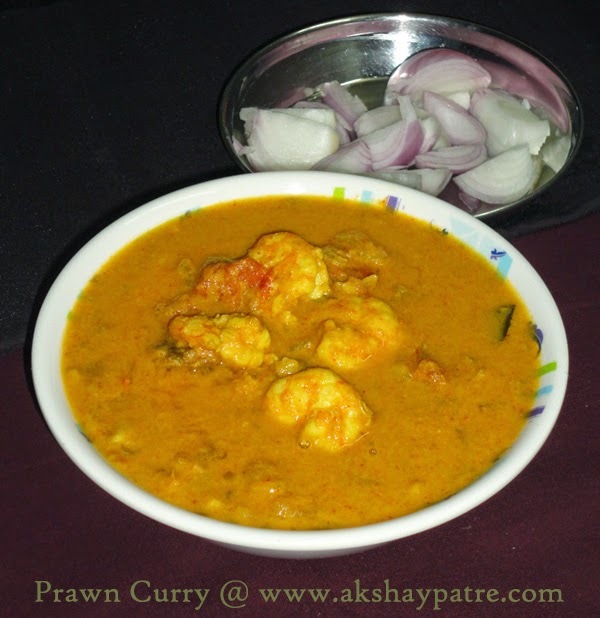 Alleppey prawn curry recipe - Today, I have come up with Kerala's Alleppey style prawn curry, slightly modified to adjust our taste buds. Traditionally, Alleppey fish curry is made using coconut oil. But I have used regular safola oil and there was not much difference in the taste and flavour. We eat fish dishes twice a week and recently I had made this curry for our meal or lunch. 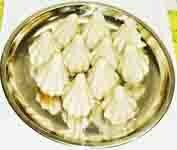 We enjoyed it thoroughly with rice and chapathi. Again, today I made this prawn curry for Sunday lunch and I am truly happy with the taste of the curry. I have used tiger prawns which is very delicious, so highly in demand and very popular. Note that prawns are very rich in proteins, hence, it should not be cooked too long. Once the prawns curl, you have to switch off the flame, otherwise they become hard, chewy and tasteless. Grind the coconut with 4 cups of water. Strain and extract the thick milk. Add 2 cups of water to the strained coconut fibers and grind to extract 2 cups of thin milk. Mix the thick milk and thin milk together and set aside. Heat the oil in a pan and add chopped green chillies and curry leaves. Saute for 1 minute. Add the onion, ginger and garlic and saute till the onions are translucent. Add the tomato and cook covered till the tomatoes cook well and turn mushy. Add the chilli powder and turmeric powder, saute for few seconds. Add the tamarind pulp, stir to combine. Add the coconut milk and mix well. Add the salt. Taste and adjust the chilli powder and salt. Bring the gravy to boil. Once the gravy boils, add the prawns and again boil the curry till the prawns curl, simmer for a minute on high flame and remove from the flame. Set aside for 5 minutes. 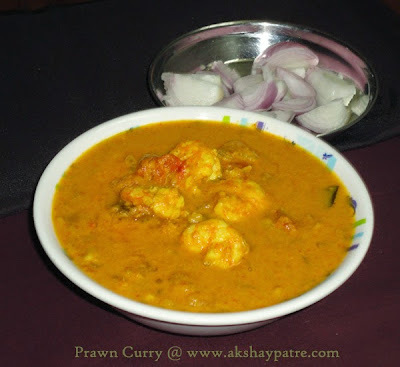 Serve the alleppey prawn curry hot with steamed rice, chapathi, dosa and rice roti. Thank you so much Remya.